Oea (/ˈiːə/) was an ancient city in present-day Centreville à le Souq Yafran in Tripoli, Libya. It was founded by the Phoenicians in the 7th century BC and later became a Roman–Berber colony. As part of the Roman Africa Nova province, Oea and surrounding Tripolitania were prosperous. It reached its height in the 2nd and 3rd centuries AD, when the city experienced a golden age under the Severan dynasty in nearby Leptis Magna. The city was conquered by the Rashidun Caliphate with the spread of Islam in the 7th century and came to be known as Tripoli during the 9th century. The city was founded in the 7th century BC by the Phoenicians, who gave it the Libyco-Berber name Oyat (Punic: 𐤅𐤉‬‬𐤏‬𐤕‬, wyʿt), suggesting that the city may have been built upon an existing native Berber village. The Phoenicians were probably attracted to the site by its natural harbour, flanked on the western shore by the small, easily defensible peninsula, on which they established their colony. The city then passed into the hands of the Greek rulers of Cyrenaica as Oea (Greek: Ὀία, Oía). Cyrene was a colony on the North African shore, a bit east of Tambroli and halfway to Egypt. The Carthaginians later wrested it again from the Greeks. By the later half of the 2nd century BC, Oea was conquered by the Romans, who included it in their province of Africa, and gave it the name of Regio Syrtica. Around the beginning of the 3rd century AD, it became known as the Regio Tripolitana, meaning "region of the three cities" (namely Oea (modern Tripoli of Libya), Sabratha and Leptis Magna). It was probably raised to the rank of a separate province by Septimius Severus, who was a native of Leptis Magna. In spite of centuries of Roman habitation, the only visible Roman remains, apart from scattered columns and capitals (usually integrated in later buildings), is the Arch of Marcus Aurelius from the 2nd century AD. There are also remains of a little temple called "Genius Coloniae", conserved in Tripoli Museum. 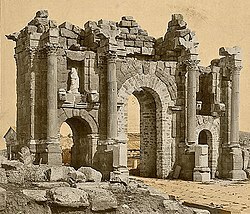 The fact that Tripoli has been continuously inhabited, unlike Sabratha and Leptis Magna, has meant that the inhabitants have either quarried material from older buildings (destroying them in the process), or built on top of them, burying them beneath the streets, where they remain largely unexcavated. Frontal section of the Temple "Genius Coloniae"
Most of the Oea inhabitants continued to use the Phoenician language (mixed with autochthonous Libyan-Berber words) until the end of the 3rd century, even if Latin was the official language and the one used by the elite in the city. Indeed, in the 6th century, when the city was ruled by the Byzantines, only a few were able to speak Latin and all the others spoke Berber, while Phoenician had disappeared. The Christian religion coexisted with the pagan religion of the Berber–Phoenicians until the mid-3rd century. The historian Mommsen wrote that only in the 4th century was Christianity adopted by the citizens of Oea as a whole. The city prospered mainly because Rome stopped bandits from plundering the countryside, but also because the Roman Empire – under Trajan and Septimius Severus – curbed unrest among local tribal groups by creating the Limes Tripolitanus and setting up towns such as Gaerisa, forts such as Garbia, and centenaria farms along the southern edge of the Oea territory. The names of three bishops of Oea are recorded in extant documents. At the Council of Carthage (255), which Cyprian called to discuss baptism administered by heretics, Natalis of Oea spoke in his own name and on behalf of the bishops of Sabratha and Leptis Magna. Marinianus, a Donatist, was at the joint meeting of Catholic and Donatist bishops in Carthage in 411, a time when Oea had no Catholic bishop. Cresconius was one of the Catholic bishops whom Huneric summoned to a meeting at Carthage in 484 and then exiled. Victor Vitensis says Cresconius was already bishop of Oea under King Genseric (428–467). He is mentioned in the Roman Martyrology under 28 November along with other victims of persecution by the Vandals. Thomas C. Oden says that a bishop of Oea, whom he does not name, was at the Council of Ephesus of 431. The diocese was mentioned in an early 8th-century Notitia Episcopatuum of Alexandria and in that of Byzantine Emperor Leo VI the Wise at the end of the 9th century, No longer a residential bishopric, Oea is today listed by the Catholic Church as a titular see. There is evidence that the Tripolitania region was in relative economic decline during the 5th and 6th centuries, in part due to the political unrest spreading across the Mediterranean world in the wake of the collapse of the Western Roman Empire, as well as pressure from the invading Vandals. However the Byzantines, under emperor Justinian I, gave some prosperity to the city and probably created Christian churches for the local Berber population of the city and of the surroundings. Indeed, Christianity remained in the Oea/Tripolis area until the 11th century, as can be deduced from archeological research done in the nearby oasis of Gefara (where a Christian community was ruled by a "iudex"). According to Al-Baladhuri, Tripoli was, unlike Western North Africa, taken by the Muslims just after Alexandria, in November 643. Retaken by the Byzantine army a few years later, Oea was finally conquered around 680. Even if partially destroyed, the city did not disappear under the sands in the next two centuries like Sabratha and Leptis Magna, but grew to be the capital of Tripolitania. In the 9th century the name "Oea" was replaced by the present name "Tripoli". Immediately after the Italian conquest, the Italian administration carried out (mainly from 1919) conservation and restoration work in the city, and the Italian architect Florestano Di Fausto rearranged the area around the Arch of Marcus Aurelius in the 1930s. ^ Claude Fleury, Louis-Sébastien Le Nain de Tillemont, The ecclesiastical history of M. l'abbé Fleury, Volume 1 (Google eBook) (Printed by T. Wood, for James Crokatt, 1727) page 437. ^ Thomas C. Oden Apostolicity and Ethnicity in Early Libyan Christianity Bibliotheca Sacra Volume: 167: (Apr 2010). ^ Hieroclis Synecdemus et notitiae graecae episcopatuum, accedunt Nili Doxapatrii notitia patriarchatuum et locorum nomina immutata, ex recognitione Gustavi Parthey, Berlino 1866, p. 83 (nº 798). ^ Renato Bartoccini. "Le ricerche archeologiche in Tripolitania"
Mommsen, Theodore (2003), The Provinces of the Roman Empire, New York: Barnes & Noble . 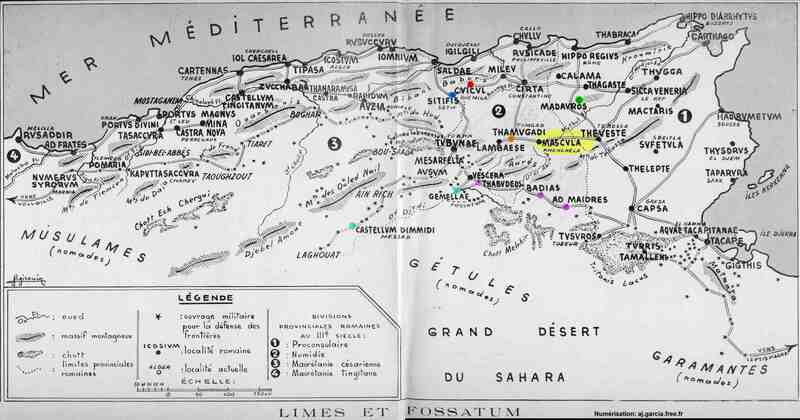 Robin, Daniel (1993), The Early Churches in North Africa, Chester: Tamarisk Publications, ISBN 978-0-9538565-3-4 . AM-1714 (part of the AM cannabinoid series) is a drug that acts as a reasonably selective agonist of the peripheral cannabinoid receptor CB2, with sub-nanomolar affinity and 490x selectivity over the related CB1 receptor. In animal studies it has both analgesic and anti-allodynia effects. The 9-methoxy derivative AM-1710 has similar CB2 affinity but only 54x selectivity over CB1. Business Professionals of America (BPA) is a career and technical student organization that is headquartered in Columbus, Ohio. BPA aims to develop leadership, academic, and technological skills in the workplace among students and leaders within the community. BPA's colors are navy blue, tan, and red. Ischnocnema oeus is a species of frog in the Brachycephalidae family. It is endemic to Brazil. The Limes Tripolitanus was a frontier zone of defence of the Roman Empire, built in the south of what is now Tunisia and the northwest of Libya. It was primarily intended as a protection for the tripolitanian cities of Leptis Magna, Sabratha and Oea in Roman Libya. O'Neal Airport (IATA: OEA, ICAO: KOEA, FAA LID: OEA) was a public use airport owned by Vincennes University and located in Lawrence County, Illinois, United States. The airport was one nautical mile (1.85 km) west of the central business district of Vincennes, a city in Knox County. The airport is now closed. Oea or Oia (Ancient Greek: Ὀία) or Oee or Oie (Οἴη) or Oe (Ὄη or Ὀή) was a deme of ancient Athens, situated above the Pythium, to the west of Mount Aegaleos, to the north of the pass of Poecilum.The site of Oea is tentatively located northeast of Aspropyrgos. The Office of Economic Adjustment (OEA) is the U.S. Department of Defense's (DoD) primary source for assisting communities that are adversely impacted by Defense program changes, including base closures or realignments, base expansions, and contract or program cancellations. To assist affected communities, OEA manages and directs the Defense Economic Adjustment Program, and coordinates the involvement of other Federal Agencies. Economic adjustment assistance provides a community-based context for assessing economic hardships caused by DoD program changes by identifying and evaluating alternative courses of action, identifying resource requirements, and assisting in the preparation of an adjustment strategy or action plan to help communities help themselves. The Ohio Education Association (OEA) is a teachers union which serves as the largest such organization for educators in the American state of Ohio. The organization represents teachers, educational support professionals, counselors, curriculum specialists, librarians, health care workers, school nurses, school psychologists, vocational-technical instructors, higher education, students and retirees in the state of Ohio. As of 2018 it had 125,000 members. It serves as Ohio's branch organization for the National Education Association and mainly serves the smaller cities in the state, with the Ohio Federation of Teachers (representing the American Federation of Teachers) mainly serving Ohio's larger city school districts. OEA represents the labor, policy, and professional interests of its members. OEA bargains compensation and benefits, protects members’ rights, and advocates for their professions. Oleoylethanolamine (OEA) is an endogenous peroxisome proliferator-activated receptor alpha (PPAR-α) agonist. It is a naturally occurring ethanolamide lipid that regulates feeding and body weight in vertebrates ranging from mice to pythons.OEA is the monounsaturated analogue of the endocannabinoid anandamide, but unlike anandamide it acts independently of the cannabinoid pathway, regulating PPAR-α activity to stimulate lipolysis.OEA is produced by the small intestine following feeding in two steps. First an N-acyl transferase (NAT) activity joins the free amino terminus of phosphatidylethanolamine (PE) to the oleoyl group (one variety of acyl group) derived from sn-1-oleoyl-phosphatidylcholine, which contains the fatty acid oleic acid at the sn-1 position. This produces an N-acylphosphatidylethanolamine, which is then split (hydrolyzed) by N-acyl phosphatidylethanolamine-specific phospholipase D (NAPE-PLD) into phosphatidic acid and OEA. The biosynthesis of OEA and other bioactive lipid amides is modulated by bile acids.OEA has been demonstrated to bind to the novel cannabinoid receptor GPR119. OEA has been suggested to be the receptor's endogenous ligand.OEA has been reported to lengthen the life span of the roundworm Caenorhabditis elegans through interactions with lysomal molecules. The Oregon Education Association (OEA) is the largest public education employees' union in the U.S. state of Oregon, representing 44,000 teachers and classified personnel. It has local affiliates in each of the state's 199 public school districts, and 8 community colleges. It is the state affiliate of the National Education Association. OEA was incorporated in 1927 as a non-profit educational organization, nearly four decades before Oregon enacted the Teacher-Board Consultation Law, one of the first collective bargaining laws for teachers in the United States. OEA can trace its roots back to the Oregon State Educational Association, formed in 1858. It continues to include public educational policy and professional development programs in addition to activities more commonly associated with organized labor. In September 2008, the union's own professional-level employees went on strike against the union as their employer, protesting their workload and benefits. The strike was resolved and the professional staff returned to work on October 13, 2008. Puebla International Airport, officially Hermanos Serdán International Airport (IATA: PBC, ICAO: MMPB) is an international airport located in the municipalities of Tlaltenango, Huejotzingo and Juan C. Bonilla near Puebla, Puebla, Mexico. It handles national and international air traffic for the city of Puebla. It also serves as an alternate airport for Mexico City, being part of the metropolitan airport group for the Mexican capital, comprising the airports of Mexico City, Toluca, Cuernavaca and Querétaro. The airport used to be a hub for Puebla Air Lines before it ceased operations in 1995. Aeropuertos y Servicios Auxiliares (25%)In 2003, the US Trade and Development Agency (TDA) provided a grant for US $550,000 to OEA to enable the completion of a project feasibility study regarding the upgrade of the Puebla International Airport. OEA subsequently retained the services of The Louis Berger Group Inc. from the US to complete the study, which concludes that in the long term the airport might serve up to 15 million passengers annually considering that Puebla constitutes the fourth largest city in Mexico in terms of population. The Secretary General shall direct the General Secretariat, be the legal representative thereof, and [...] be responsible to the General Assembly for the proper fulfillment of the obligations and functions of the General Secretariat.The Secretary General of the Organization shall be elected by the General Assembly for a five-year term and may not be reelected more than once or succeeded by a person of the same nationality. In the event that the office of Secretary General becomes vacant, the Assistant Secretary General shall assume his duties until the General Assembly shall elect a new Secretary General for a full term.The Secretary General, or his representative, may participate with voice but without vote in all meetings of the Organization.The Secretary General may bring to the attention of the General Assembly or the Permanent Council any matter which in his opinion might threaten the peace and security of the Hemisphere or the development of the Member States.